Yesterday I shared the process I went through to create the front and back covers for Darcy & Elizabeth: A Season of Courtship. That creation was arduous partly because it was my first foray into creating a cover, and also because I had to create a back cover and spine for the print version. Today I’ll share the steps in creating the cover for the second book in the Darcy Saga Prequel Duo. Darcy & Elizabeth: Hope of the Future has a tentative, hopeful release for June or July 2014. I have yet to create the back cover, so will probably talk about that at a much later date. The front cover I wanted to have done so I could reveal the news of two books versus one with a nice visual! To the right is the finished product. In truth, there were several options that excited me, so narrowing it down was difficult. One image that I really loved (seen below) was unfortunately a new creation by a Deviant Art designer. I could have asked permission to use and then tweaked it to not be a snowy scene, but because I had so many other options, I didn’t take the time to pursue it. 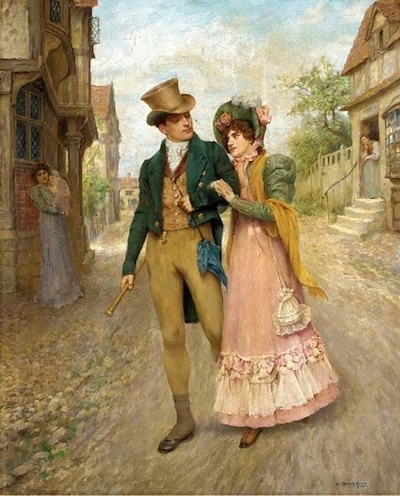 The painting I chose – “Newly Married” by William A. Breakspeare (1856-1914) – was, of all the options, closest to the Knowles painting used on A Season of Courtship. Plus, the title appealed! Another perk was that the pic was perfect, the only enhancement being a slight brightening of the colors and increase in the clarity. Below is the original version. Look carefully for one big difference between it and my cover. Did you see them? Mr. Bingley and Jane Bennet? Yep! 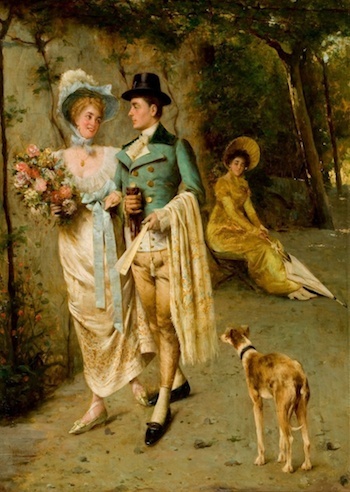 Just for fun, I took the couple from the painting below – “An Afternoon Stroll” by Pompeo Massani (1850-1920) – and used GIMP to erase the background and layer the people onto the main image. Doing so also served the purpose of covering the woman in the doorway. Cool! Are they heading to the church? Or maybe leaving after the wedding? Or perhaps simply strolling the streets of Meryton in the week or so before the ceremony? Could be any of those options! To make clear the theme of “wedding” I found the lovely painting of Saint Giles Church in Stoke Poges, Buckinghamshire. No particular reason other than I really loved the old look to this church. For the title background I used a blank frame graphic, recolored it green to match Darcy’s jacket, and chose a marbled background. Again I went to Cool Text for the title, using “brock” script for a change, and the same green color as the accent. All in all, this cover was much easier to put together. I used GIMP, of course, and worked on it in one afternoon, while watching the BBC version of Sherlock at the same time. Love that show! What do you think? I am very pleased with both and can’t imagine changing anything. But, another nice aspect to creating my own covers is that IF I felt the need to alter something, I just open up the saved files in GIMP and tweak as needed. Sweet! Has hope for the future been released? This is also my question. I feel like I’ve been waiting forever for it to be released. I know that you (Sharon) have said that you’ve lost your muse and interest in continuing this story for reasons of your own but please, please put is all out of our misery. You must have had a near completed novel if you had already designed the cover and set a tentative release date, so how can we convince you to continue on with it or to at least answer any of these comments, even if the answer is never to be finished! When will Hope for the Future be published? I’ve been waiting a long time!! Do you have a release date for Hope of the future yet? I’ve been waiting years!!! Do you have a release date for Hope of the Future yet? Absolutely beautiful, Sharon. It is the type of cover that draws the eye. You have far more skill than I do. What day did you say this would be available? Mahal nut loa for you wonderful novels. I just finished A Season of Courtship and I am anticipating the next installment. I will be reading THE rest of the saga( for the 6th time) while I wait. Please keep writing new material. Amazing Sharon. You have done a wonderful job on both covers they are both beautiful in their own right and I think the second is my favourite. I didn’t realise there are so many things to consider when you are adding and changing images. It is all so interesting to learn and I would have had no idea that so much work has gone into perfecting the pictures to suit the cover. I love your addition of Jane and Bingley very clever ! You are very talented and creative, Sharon. Thanks for sharing the process of creating your book covers. I love both paintings of couples that you choose. And I’m another fan of Sherlock. Ah, thanks Luthien. I really enjoy creating images and that sort of thing. That is why I design my own website, and Austen Authors when it was live. Another form of artistic expression, I suppose! And, I confess, I am a control freak, so prefer to make something exactly as I want it! I had held out on watching Sherlock until it was in a ways. I hate starting a series, getting hooked, and then having the plug pulled on it. So, with 9 episodes done I figured it was safe! Plus, I am a HUGE fan of Elementary. So it was fun to see how similar and different the two Sherlock Holmes series are. Both are really excellent. I like your choice of painting for the cover and agree the characters look similar…although your second choice would’ve been so romantic…but the choice is nice. I did see Bingley & Jane when you pointed them out…..I love the layout of the cover, another beautiful job. Looking forward to this release as well. Thanks Deborah. Yes, with the second book I figured a more romantic pose would work. Nothing too steamy, of course. But a sweet kiss would do. I just didn’t find any that worked or were accessible. Love the pic in the snow!!! You did great on the cover!!! No explanation on the house?????? Do you mean the house on the street? Specifically the one “Jane and Bingley” are walking out of? I rather imagined it either the church steps or if not the wedding day itself, a day walking along the streets of Meryton just before the wedding. Anything would work! Thank you, again, for sharing your process for the covers. It is so cool to know the “behind the scenes!” By the way, I love Sherlock as well AHHHHH and it made my day how you just threw that comment in there. 🙂 I am looking so forward to this book.